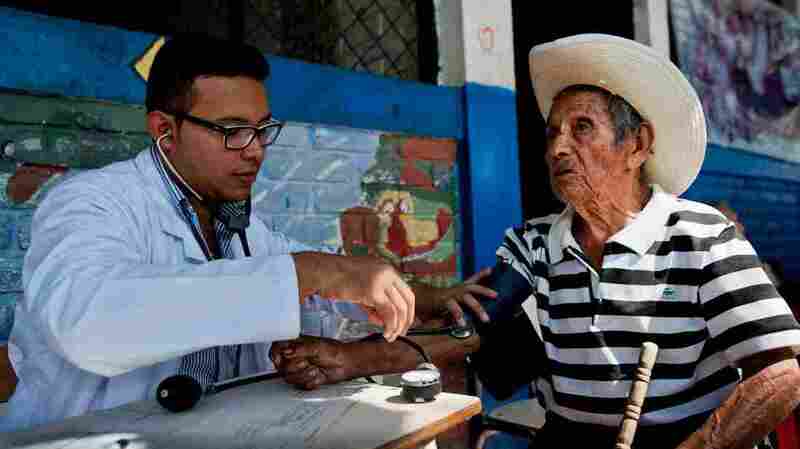 A doctor examines a patient during a June campaign to find chikungunya cases in the town of Ayutuxtepeque, El Salvador. The country reported more than 100,000 cases of chikungunya in 2014. Most of us will remember 2014 as the year Ebola came to the U.S. But another virus made its debut in the Western Hemisphere. And unlike Ebola, it's not leaving anytime soon. The virus is called chikungunya: You pronounce it a bit like "chicken-goon-ya." Although the illness is rarely fatal, it's by no means mild, says virologist Ann Powers of the Centers for Disease Control and Prevention. It causes such severe joint pain, she says, that "people who have it can't stand up or don't even want to shake your hand because it's too painful." Until recently, infection with the mosquito-borne virus was restricted mostly to Asia and Africa. Then, in December 2013, a few dozen cases cropped up on the island of St. Martin in the Caribbean. By February, there were thousands of cases across the region, and hundreds of thousands by June. In July, chikungunya had spread to Central America, South America — and Florida. "Chikungunya is an amazing virus," Powers says. "It spreads incredibly fast and is very aggressive. In some communities, more than half the population gets sick." The Western Hemisphere recorded more than a million cases of chikungunya in 2014. The U.S. had more than 2,000 cases, with about 500 of those in the state of New York. In nearly all these instances, U.S. residents caught the virus outside the country and then brought it back home. But in Florida, the virus set up shop. The mosquitoes in southeastern Florida got infected with chikungunya and spread the infection to at least 11 people. 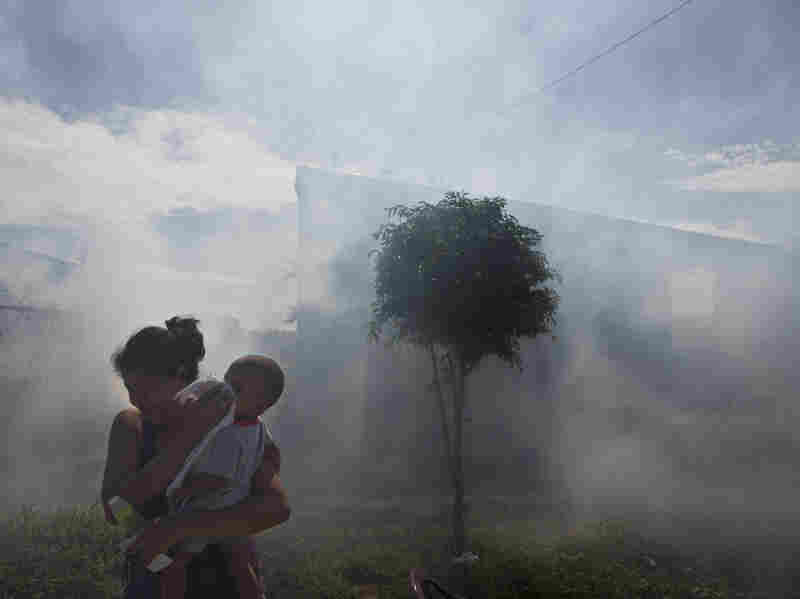 A woman protects her child's face in Managua, Nicaragua, as health workers fumigate for mosquitoes that carry chikungunya. The virus started spreading through Nicaragua and Mexico in the fall. "That's not very many," says Walter Tabachnick, who leads the Florida Medical Entomology Laboratory at the University of Florida. "But we're worried about this. All the blocks are falling into place. You've got to be worried about this." Florida and the regions around the Gulf of Mexico have all the right ingredients for a huge outbreak in 2015, Tabachnick says — the types of mosquitoes that carry chikungunya, as well as a steady flow of travelers from the Caribbean and Central America (where the virus is just gaining a foothold). Mexico reported its first case of chikungunya in November. "There's very little predictability for chikungunya," Tabachnick says. "But would 50,000 or 100,000 cases in Florida be surprising? I don't know. I don't think so. I wouldn't be surprised." The take-home message, Tabachnick says, is twofold. First: Clean up your yard. Get rid of all standing water, where mosquitoes grow. That includes watering cans and flower pots, he says — anything with a small puddle of water in it. And second: "Stay tuned," Tabachnick says. "We haven't seen the end of this. There will be other cases." Chikungunya is just getting started.